In recent years, designers and remodelers have placed far more emphasis on enhancing bathroom elegance and functionality than ever before. 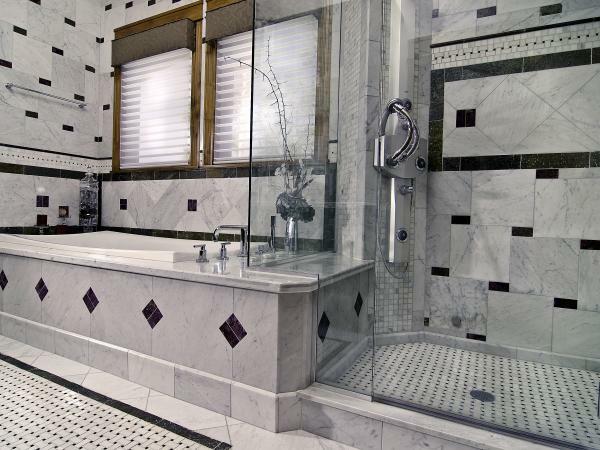 Many have chosen to make bathrooms more spacious and definitely more stunning than some other areas of the home. Prospective home buyers are frequently as critical of drab bathrooms as they are of boring and impractical kitchens. If you haven’t already, it is high time to light up those bathrooms with decorative stone tile from PetraSlate Stone and Tile in the Denver area. A decorative and imaginative stone tile design can convert boring to exciting in little time. With PetraSlate’s line of slate, travertine, and limestone/marble tiles, available in a host of colors, textures, and sizes, the selection of design ideas is nearly limitless. Whether you are brightening a small bathroom space or creating a muted and lush ambiance for a larger bathroom, PetraSlate tiles offer just the right shades and textures to achieve the desired aura. Because stone tile is nonpourous, it happens to be the ideal material for bathroom floors and walls. This doesn’t suggest that the same tile must be used throughout a single room. Design interest results from applying complentary colors, sizes, and even textures of tiles to create a harmonic effect that is pleasing to the eye. Coordinating walls, backsplashes, shower areas, countertops, and floors with the various stone and glass tile options can result in a very pleasing bathroom design. PetraSlate of Denver representatives can help with fresh design clues and ideas to create a unique feel to any bathroom. Slate rock is composed of volcanic ash or clay formed after thousands of years of pressure. This compression makes slate one of the finest-grained rock material that is perfect for either wall covering or flooring. The material comes in a variety of shades making it ideal for creating unique tile designs. Slate tile imparts a spa-like, natural feeling to any bathroom. Travertine is a form of limestone formed near hot springs. The material has been used for centuries and is quite common in Europe and particularly in Italy. PetraSlate’s Travertine line can help you to achieve a true “old world feel” in any bathroom design. PetraSlate’s Travertine stone tile line consists of 17 styles and shades to replicate the bathroom look of your dreams. Marble is a metamorphism of limestone that derives its unique appearance from the carbonate crystals that form during the transformation. Depending on the sedimentary minerals involved in the formation of the material, a wide range of interesting colors, shades and designs have evolved. The varied nature of this stone is what creates the most interest. Limestone/Marble tiles add elegance to any room and may be used on the floor or walls of bathrooms to enhance the overall beauty.